S I G N & D I G I T A L G R A P H I C S • March 2019 • 17 to this style of system for retrofitting." Lower cost is just one piece of the puzzle that helps sign makers posi- tion LEDs as a viable retrofit solution. 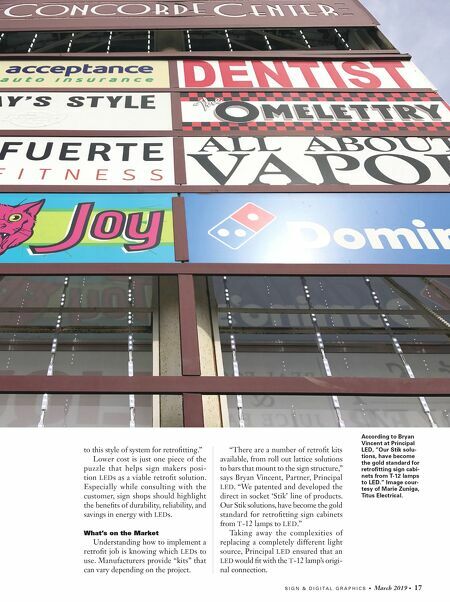 Especially while consulting with the customer, sign shops should highlight the benefits of durability, reliability, and savings in energy with LEDs. 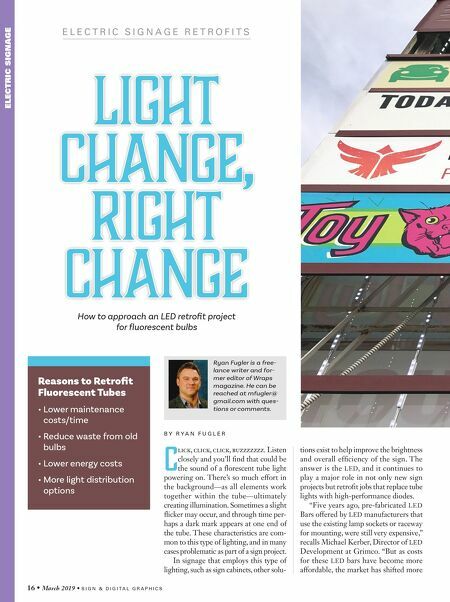 What's on the Market Understanding how to implement a retrofit job is knowing which LEDs to use. Manufacturers provide "kits" that can vary depending on the project. "There are a number of retrofit kits available, from roll out lattice solutions to bars that mount to the sign structure," says Bryan Vincent, Partner, Principal LED. "We patented and developed the direct in socket 'Stik' line of products. Our Stik solutions, have become the gold standard for retrofitting sign cabinets from T-12 lamps to LED." Taking away the complexities of replacing a completely different light source, Principal LED ensured that an LED would fit with the T-12 lamp's origi- nal connection. According to Bryan Vincent at Principal LED, "Our Stik solu- tions, have become the gold standard for retrofitting sign cabi- nets from T-12 lamps to LED." Image cour- tesy of Marie Zuniga, Titus Electrical.